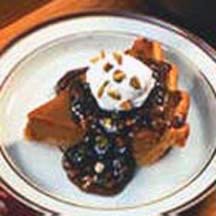 Traditional pumpkin pie served with a rich pistacho praline sauce. For Praline Sauce: Combine brown sugar and cornstarch; add water. Cook and stir over medium-high heat until thickened and bubbly. Stir in butter and vanilla. Add pistachios just before serving; mix well. Serve warm or cool over Pumpkin Pie. Top with a dollop of whipped cream; garnish with additional chopped pistachios. Makes about 3/4 cup sauce. For Filling: In a small bowl beat the eggs. Add pumpkin, sugar, cinnamon, ground ginger, salt and ground cloves; mix thoroughly. Blend in milk. Pour into unbaked pie shell. Bake for 15 minutes; reduce heat to 350°F (175°C) and continue baking 45 minutes or until knife inserted near center comes out clean. Recipe and photograph courtesy of the California Pistachio Commission.